The Belfast Giants beat Cardiff Devils in a penalty shootout to close the gap on Elite League leaders Nottingham Panthers to two points. The match ended 3-3 after overtime with goals by Jesse Gimblett (2) and Mark Richardson putting Cardiff 3-0 ahead. Craig Peacock, Daymen Rycroft and Colin Shields replied for the Giants, who won the shootout on a 3-2 margin. The Belfast Giants beat the Hull Stingrays to stay in with a chance of retaining the Elite League crown. Peacock scored two penalties for Belfast, with Jeff Mason also finding the net for the visitors. Robby Sandrock was unsuccessful with two penalty attempts and Mason with one. The Devils raced into a three-goal lead at the end of the first period but goals by Peacock and Rycroft reduced the deficit to one by the end of the second. Shields scored late on to take the game into overtime, which failed to produce a winner. Leaders Nottingham lost 5-2 at Sheffield to allow the Giants to move to within a couple of points. Doug Christiansen's side had enjoyed a 5-4 victory over Hull Stingrays at the Odyssey Arena on Saturday evening. 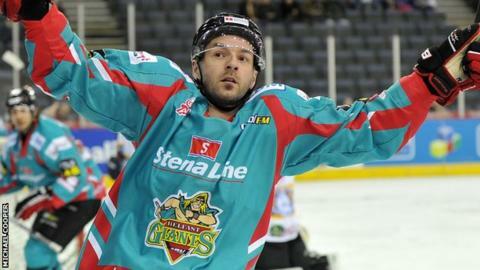 Sandrock (2), Kevin Saurette, Gregory Stewart and Shields were the goalscorers for the Giants. Kurtis Dulle (2), Dmitri Rodin and Tom Squires were on target for Hull. Hull took an early lead through Dulle, but Saurette and Shields found the net to ensure that the Giants took a one-goal advantage into the second period. Shields and Sandrock scored to extend Belfast's lead but Dulle and Rodin replied for the visitors. Sandrock secured his second of the game and Tom Squires grabbed a late consolation.